The North Carolina Aquarium at Fort Fisher is at the end of a long road that is not on the way to anything else. You are never going to accidentally stumble upon this place. If you end up there, it’s because you purposely wanted to visit or because you got unbelievably lost. That said, it was worth the trip. It’s a mid-sized aquarium, smaller than the Baltimore Aquarium my parents took me to as a kid (where a bird pooped on my dad’s head in the tropical rain forest exhibit), but larger than my mom and I thought it would be. It’s very kid-friendly. There were interactive exhibits scattered throughout the building where you could play games, hunt for fossils, and more. There was even a shallow pool where you could pet horseshoe crabs and manta rays. Yes, I touched a manta ray! And I forgot to wash my hands before I had dinner later that night, but miraculously did not contract any diseases, thank goodness. They also had one of those spiral wishing wells that I loved as a kid, and still love actually, which is why I sent a penny off to spiral down it magically. 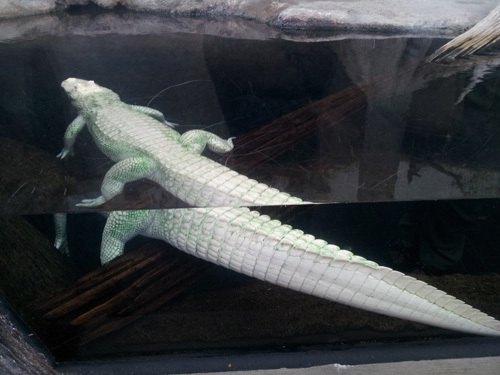 The aquarium is also home to Luna, the albino alligator, who is one of only 50 known albino alligators in existence. 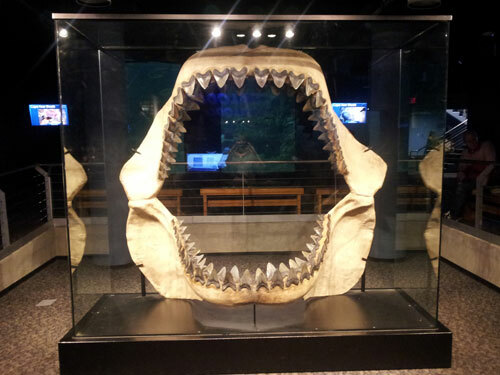 There was also the skeletal jaw of a megalodon, a creature I am very glad is extinct, because it could open its mouth as wide as I am tall. 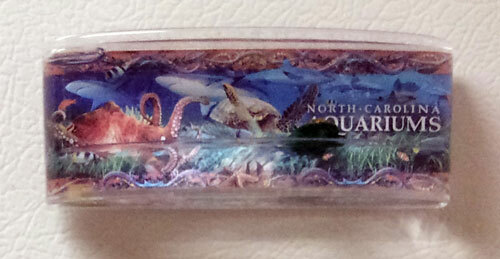 The Fort Fisher location is one of four aquarium/aquarium-like locations in the state, one of which is my pier! Yes, they spell Jennette the same way I do! 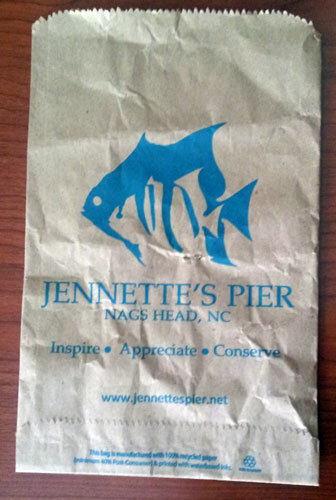 Jennette’s Pier is in the outer banks, which is something like a four hour drive from Chapel Hill. I did drop by Jennette’s Pier in 2009, but it was still under construction at that point, so all I saw was a sign. I’d like to get back there eventually, but don’t know when I will. 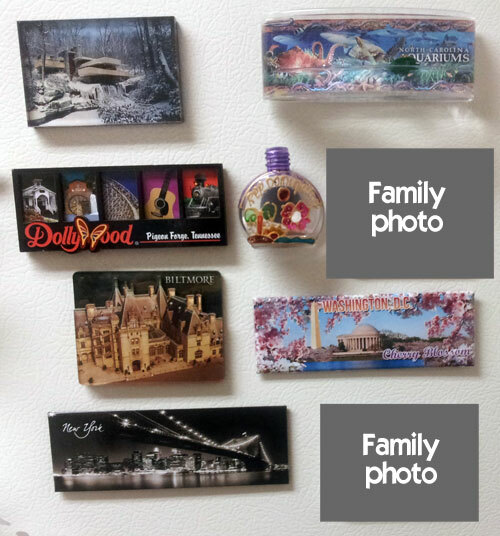 We stopped by the gift shop on the way out, which is where I bought a magnet that has little turtle floating in it. The only down side is that when I travel home with them I’m paranoid that they’ll get too close to my computer hard drive and erase my data, or demagnetize my credit cards. Nothing awful has happened yet, but I’m hyper vigilant about it. 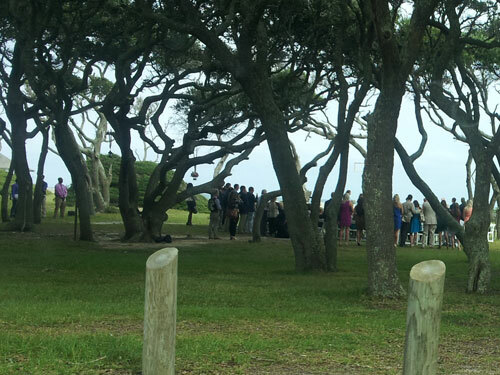 After visiting the aquarium we headed to Kure Beach, but stopped to gawk at a seaside wedding among the trees on the way there. As we continued on our way we would pass large, two-story, beachware stores every block or two. Instead of having a Starbucks on every corner, they had these brightly colored buildings advertising end-of-season sales. I don’t know how they stay in business. I guess the flip-flop industry is way more profitable than I assumed. My mom got so distracted by a large, pink store in the distance that we nearly slammed into the back of a car that had stopped to make a left turn. These buildings are road hazards! We lucked into a great parking spot near the Kure Beach pier. It took us a minute to figure out how to get onto the pier though because the chain link gate we thought was the entrance was locked. It turns out you have to go through a building to get onto the pier. I suppose this is so they have a chance to sell you souvenirs and fish bait. Please don’t get the two confused! 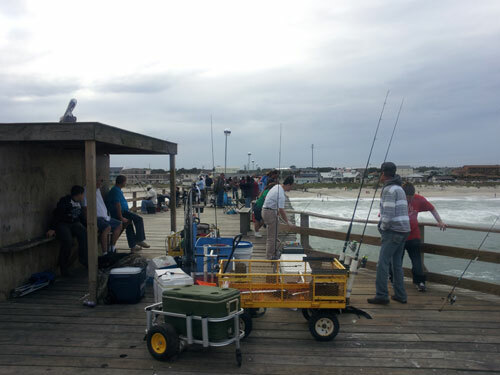 We arrived about an hour until sunset, so the pier was really busy. My mom said that was because the best time to catch fish is at sunrise or sunset. Coincidentally this is also the best time to kill wasps, which I learned during my moving-in experience four years earlier. 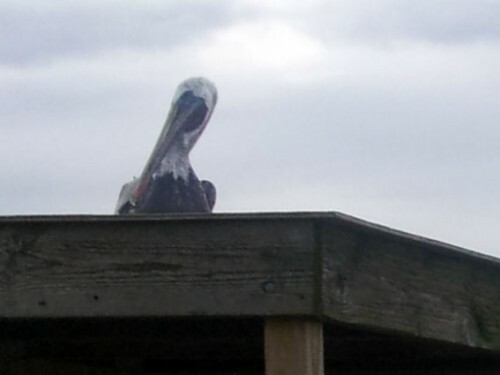 As we walked to the end of the pier we noticed there was a pelican just chilling out on the top of a wooden shelter. The only thing I knew about Mrytle Beach is that it was the place the mother wanted to retire to in the movie October Sky. I know that’s totally random, and I have no idea why I remember that particular detail about that movie. It takes a little over an hour to drive there from Wilmington, and then it took us awhile to find parking. We finally settled on a spot by a parking meter and fed it lots of quarters before heading to the boardwalk. Mrytle Beach has a nice little boardwalk, though it’s nowhere near as massive as the one at Ocean City, Maryland that I visited as a kid. Still, it’s a good place to watch the ocean, take a walk, and buy an ice cream cone in one of 50 flavors. 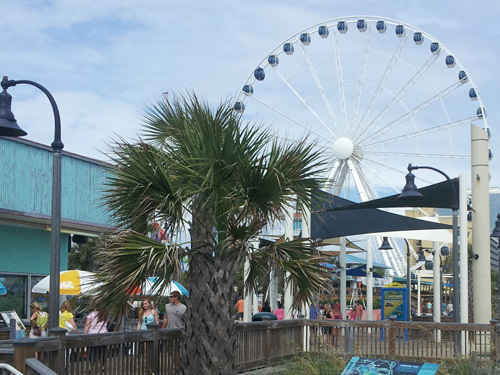 There was a ferris wheel, an arcade, and other attractions like a Ripley’s Believe it Or Not museum that had a cardboard box in front of it that said “Free Kittens” that would then blast a loud sound at you when you peered in. We only stayed for an hour or so before heading back to Wilmington, and then back to Chapel Hill the next day. 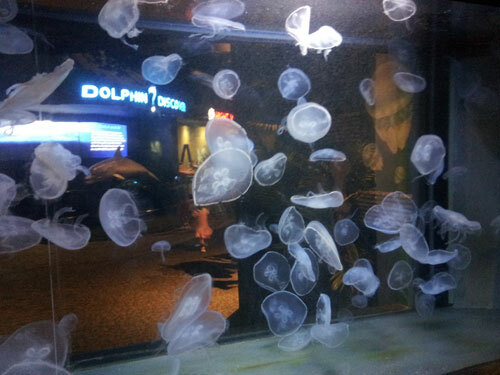 Overall it was a great trip and I’m fairly certain I’ve washed off all the manta ray germs on my hands by this point. Earlier: Uh, my bad, but I don’t actually like to be called Jen. I love Wilmington!! It’s been several years since I’ve been there, but the beaches are lovely! I can’t wait to go back someday! I had a good laugh about the box with the “free kittens” sign ! When did you visit Fallingwater??? And where is your report on the trip?? @Maggie – I went in September of 2012 and never got around to writing it up. It was raining the day I went and as we walked to the house the storm really picked up, leaves were blowing everywhere, it was kinda crazy. Otherwise it was really cool. It actually sounds VERY cool — looking out from that beautiful structure into a blowing storm. I’ve always thought it would be grand to see it in the snow. …disappointed that I was going in winter, but it turned out to be the MOST spectacular time to see the falls. They’re actually solid ice at the edges, which is stunning, with colored lights on them at night.